It includes a territory about 500 square kilometers located in the Patagonia South, on border between Argentina and Chile, but in Argentine territory. In addition to Cerro Torre (3128 meters 10262 ft) also the Fitz Roy (3405 meters 11171 ft.). For those who want the approach to landing 3-10 miles, I recommend using the runway start on 31, from the south. The approach from North is much more complicated. Heliports some landing pads have been inserted in the most important points of the scenery, normally located in residential areas, and in the area the Base Camp at Cerro Torre. El Chalten has been completely rebuilt with 3D buildings models, and although they are simplified, they are well recognizable. Some of these have been faithfully reproduced based on photos. The 2 main mountains of area have been reconstructed with 3D models. DEM data was used and further corrected with 3D graphics programs. Later the textures were applied, mostly HD, taken from high definition pictures. The positioning on the modified mesh was very accurate, respecting the dimensions and the main morphological terrain features. 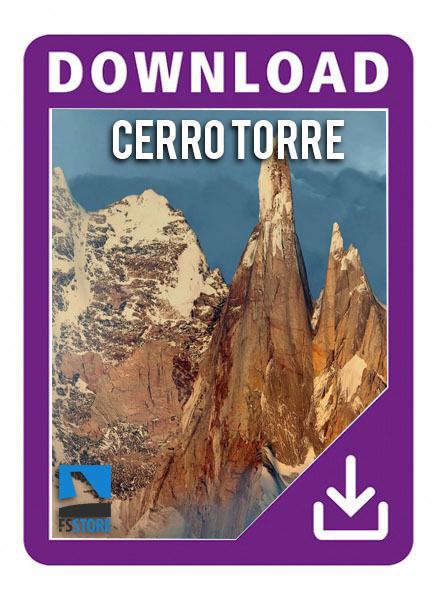 The Cerro Torre (3128 meters, 10 262 ft.) Has been practically rebuilt from scratch, using the many pictures and descriptions available, in fact the basic meshes, even the most detailed ones are practically blank on the vertical walls. The other mountain of great effect due to its dimensions and its pyramidal shape is the Fitz Roy, 3405 meters high. 11171 ft. Relatively easier to climb, it is very demanding for the strong exposure to the icy winds coming from the Antarctic pole.